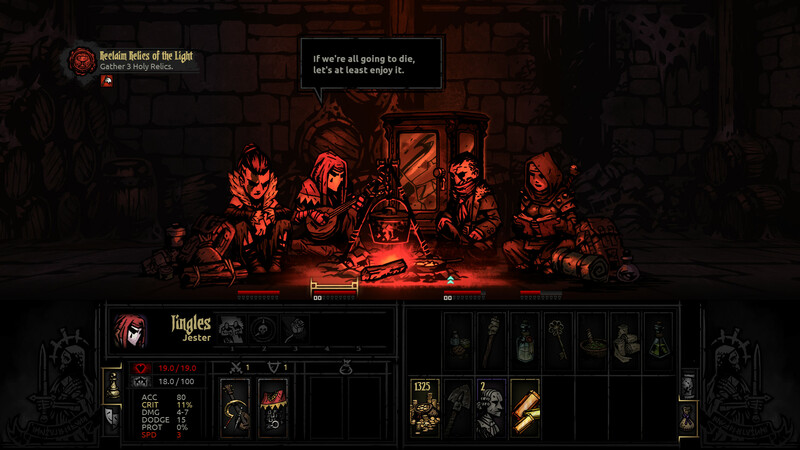 Developed by Red Hook Studios. Published by Red Hook Studios. Released on January 19, 2016. Available on PC. Press preview code provided by publisher. 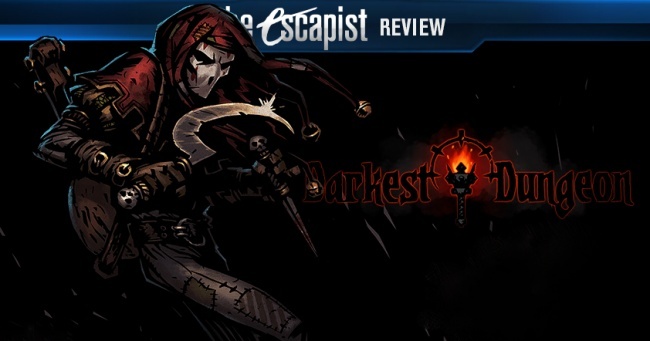 Disclaimer: This reviewer is a backer of the Darkest Dungeon Kickstarter campaign. 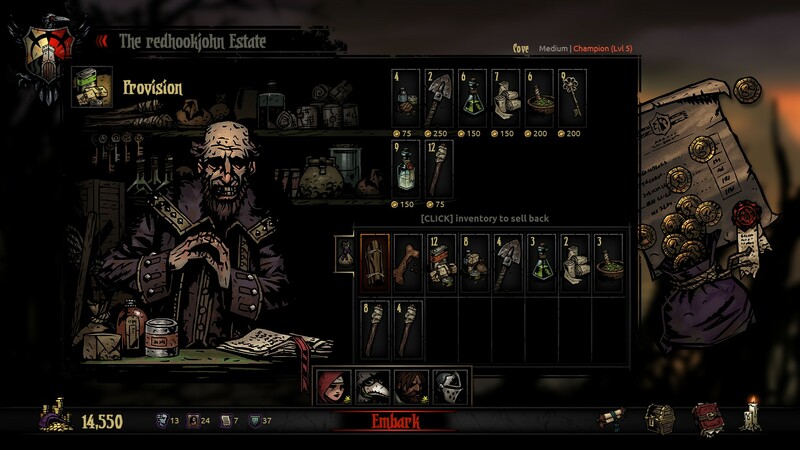 Darkest Dungeon is set in a bleak, fantasy world where you have just inherited a once-lavish estate. The previous owner, your relative, became obsessed with rumors of a portal to magical realms buried under his mansion, and spent an entire fortune to unearth it. Unfortunately for him, he was absolutely right - and unleashed eldritch creatures onto the entire property. Now you must reclaim the estate lands in the family name, hiring adventurers who can explore its varied depths and purge this evil from the land. Sounds like your typical, heroic RPG, right? 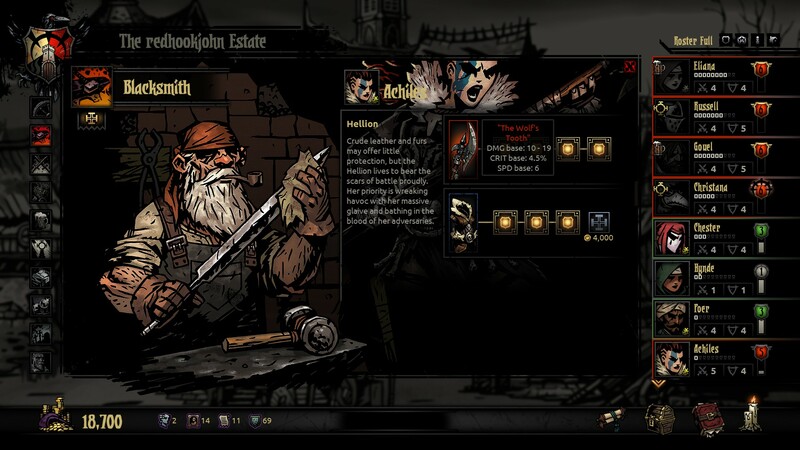 Well Darkest Dungeon's premise makes it far from typical. Your adventurers are not elite champions who laugh at danger, but flawed mortals who crack under pressure. Every time they face a monstrous abomination, fall prey to eldritch spells, or are simply left in the dark without torches too long, their stress levels build to a breaking point. 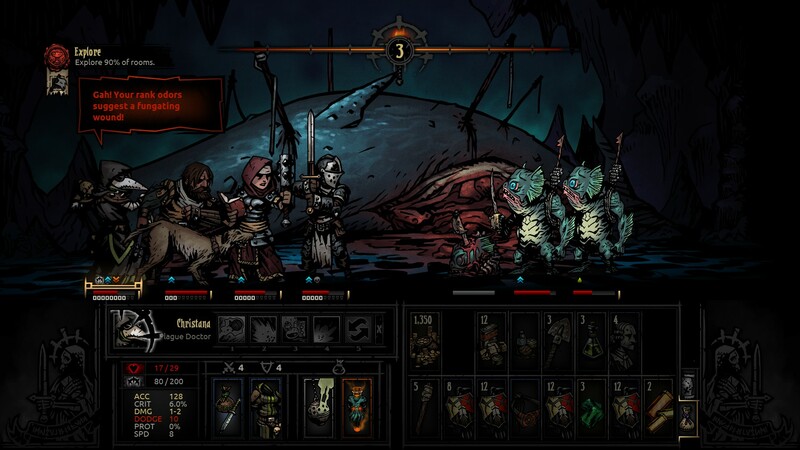 Rallying to defeat enemies and using skills to account for stress can help, but it's usually easier to manage the health of adventurers than keep their sanity in check. 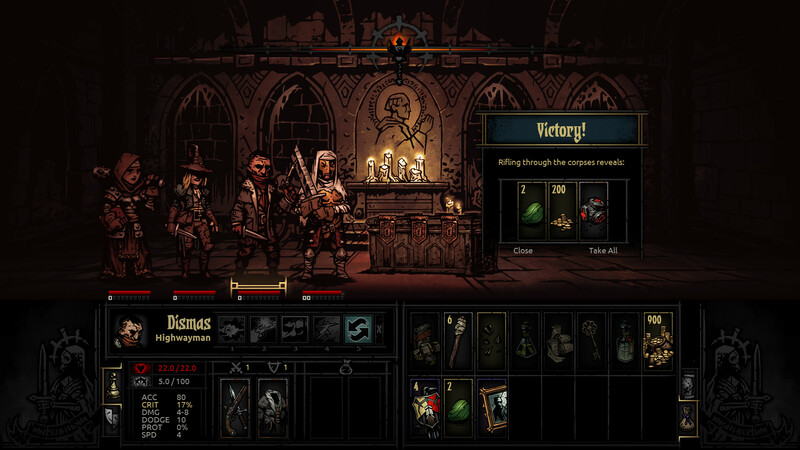 In terms of execution, Darkest Dungeon's mechanics are fairly straightforward. 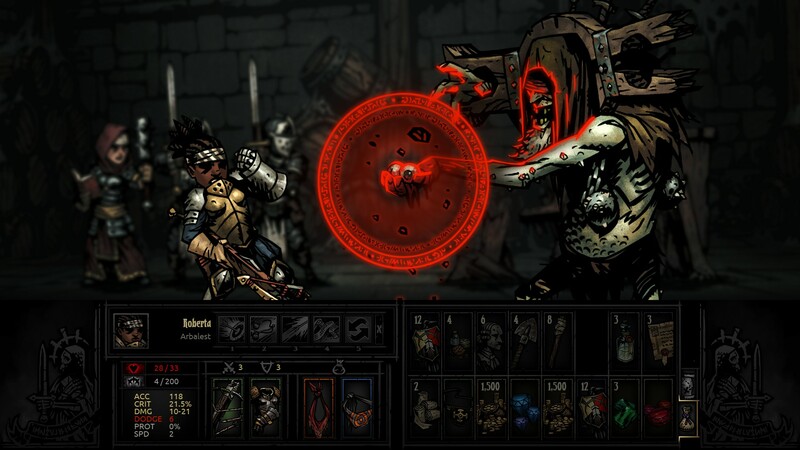 Gameplay revolves around RPG-inspired dungeon crawls, where you choose a procedurally-generated quest, purchase provisions, and send your heroes into the a series of side-scrolling chambers. While inside, they'll search chests, disarm traps, and facing enemies like adventurers do. Once the primary quest conditions are completed, they can return home with their loot, increasing progress bars in the region and unlocking more challenging quests for future attempts. While surviving physical encounters is challenging enough, it's the mental stress that really takes its toll. There are many factors that slowly break a hero's resolve, and left unchecked might even prompt a mental disorder. At that point, adventurers will actively sabotage your efforts to complete the quest, committing to poor skill choices, On top of that, each character develops positive and negative quirks as they level up. 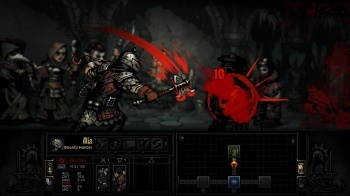 The same hero with a damage boost against certain enemy types might obsessively open doors before anyone can check for traps. 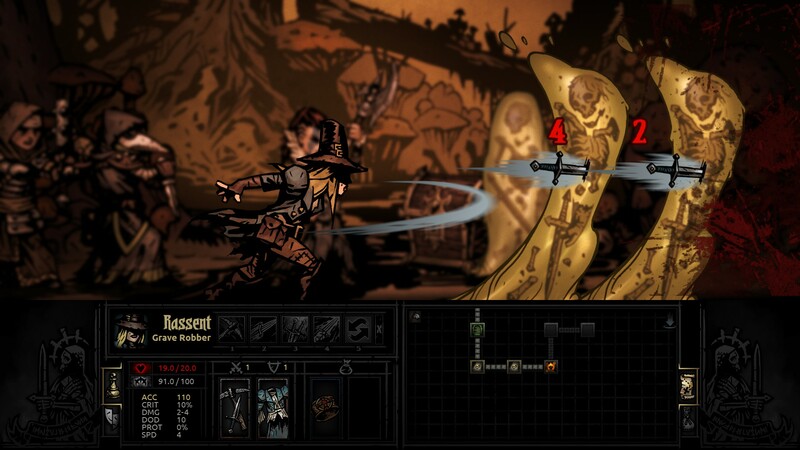 Each character is both a valuable asset and a deadly liability - making each quest interesting as well as risky. 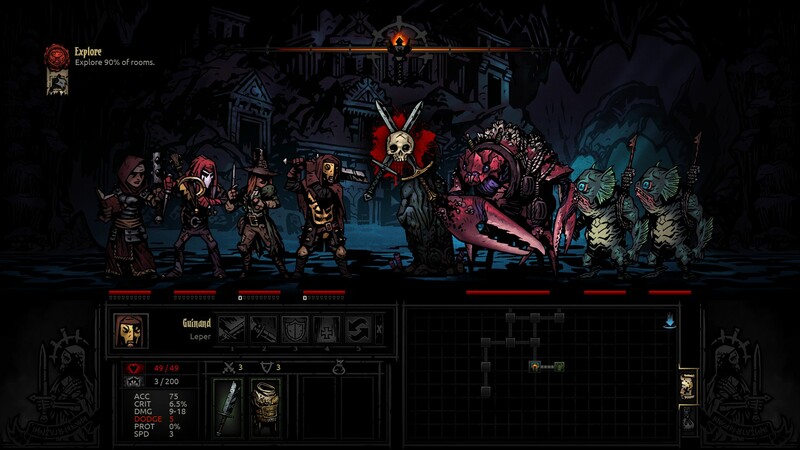 With all its overlapping mechanics, Darkest Dungeon certainly doesn't look that straightforward at first glance. 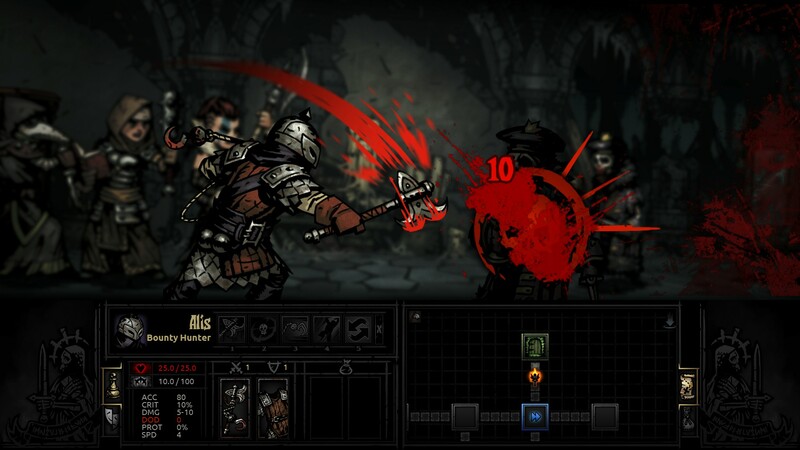 Like any number-crunchy RPG, there are countless attributes, hit percentages, skills, and buffs flying across the screen during any given combat. 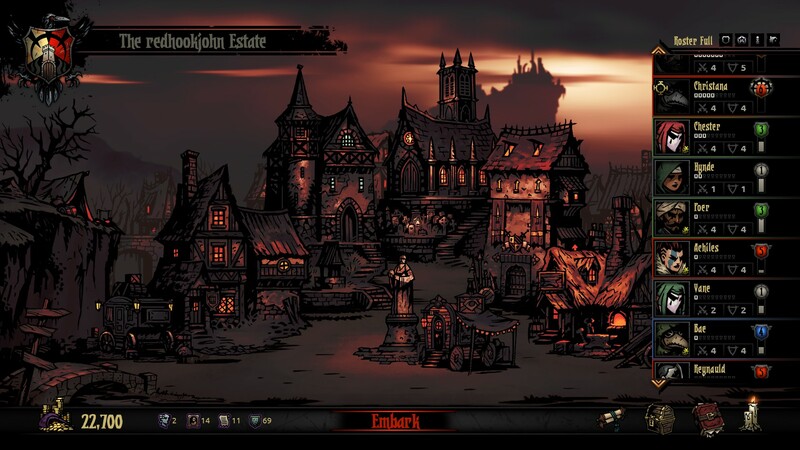 While adventurers unwind at the hamlet, you can treat quirks at the sanitarium, upgrade their weapons or armor, and slowly build multiple balanced parties. What's impressive is that all the content is streamlined just enough so novice players aren't completely overwhelmed, while old-school gamers can min-max parties to their hearts content. The monsters are always your greatest threat - not the control interface you're using to fight them. Which brings us to the game's fabled difficulty. 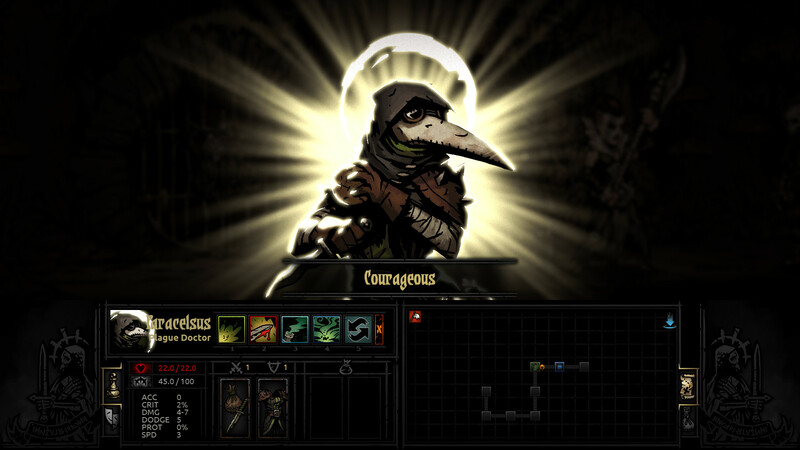 Rest assured, Darkest Dungeon is a hard game - but also a fair one. It's always possible to defeat even the most challenging enemies with a little forethought and planning. In a worst case scenario, you can always abandon a quest or battle to save the lives (and loot) of your prized adventurers. 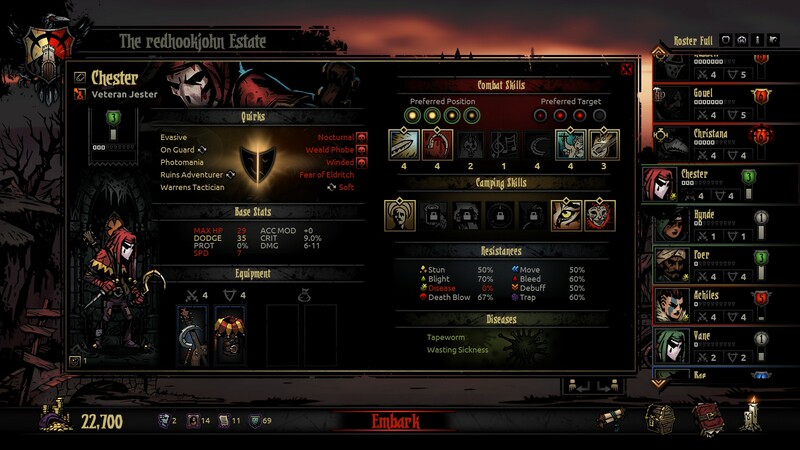 But Darkest Dungeon's most insidious challenge is psychological: With great risk comes great reward. Buying fewer provisions gives you more room to carry gold, but makes it harder to patch up adventurers between battles. 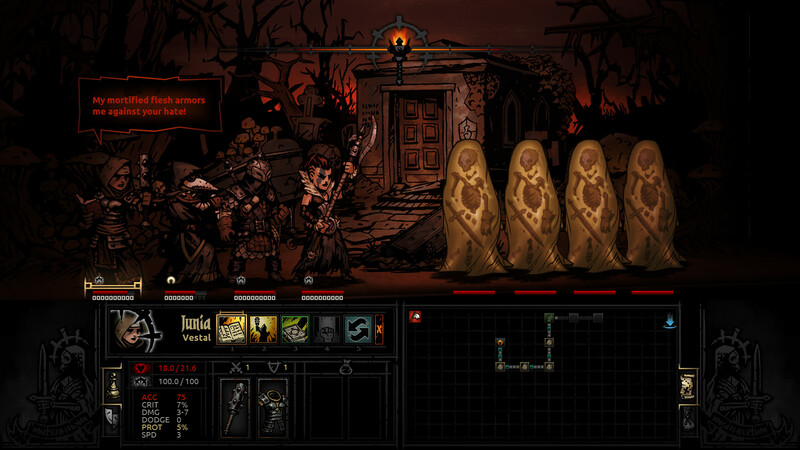 Letting your torchlight fall into darkness makes monsters challenging, but also increases the rewards for surviving them. And worst of all, when your forces are heavily damaged but there's just one room left to earn that fat quest bonus ... It's almost too tempting to ignore. And when you die, you only have yourself to blame. 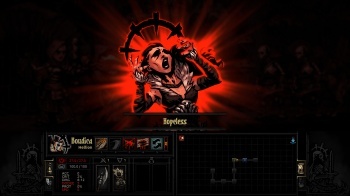 Even if you play it safe and only take on the safest quests, Darkest Dungeon never stops feeling deadly and oppressive. The art is cartoonish, but exaggerates dark tones, pained expressions, and gory scenes that are always unsettling. Then you have the narrator's somber voice following you across the entire game, reinforcing the game's dangers until you almost forget he killed himself during the opening cutscene. 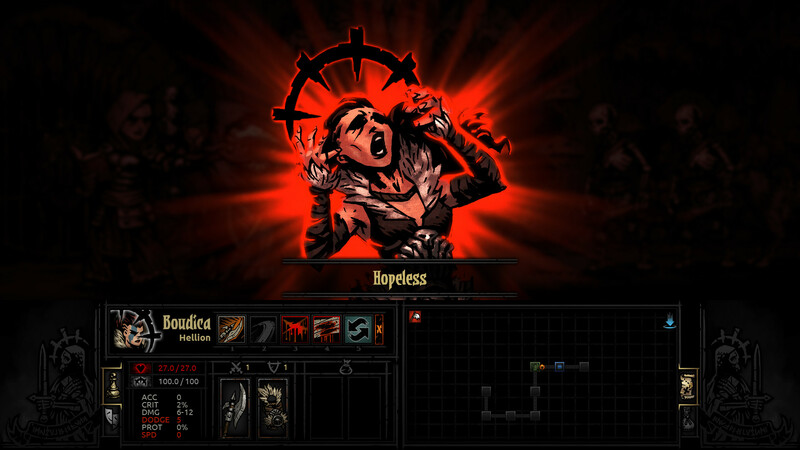 Darkest Dungeon absolutely nails its bleak atmosphere, which gets under your skin and stays with you long after you play - much like the stress adventurers carry back to the hamlet after their quests. That's not to say the game's challenges can't be objectively frustrating. Making a single mistake - especially on the challenging boss fights - could wipe out a party or have lasting impacts on individual heroes. It also doesn't help that character skills can't be used between battles, including healing actions, which makes little internal sense when you could cast dozens during combat. Building up your heroes over multiple sessions only to watch them fall in a single encounter is absolutely rage-inducing, if only because it will take forever to train a new adventurer up again. 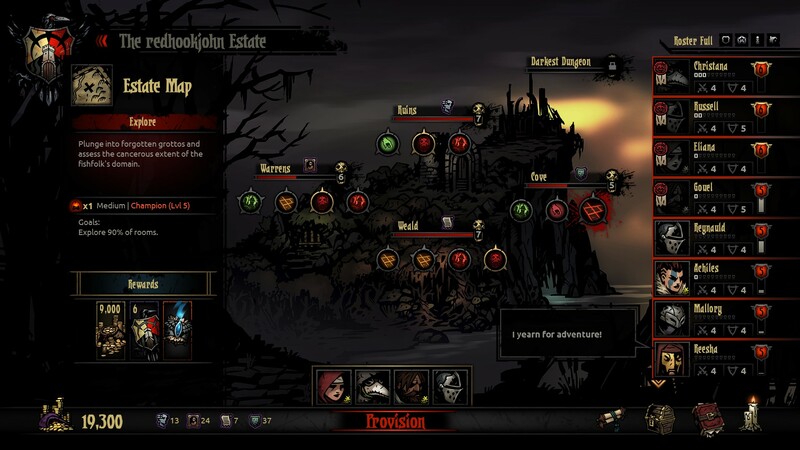 Now consider this - the four "Darkest Dungeon" missions required to beat the game will still force adventurers to retire should they survive. That means at minimum you'll have to create 16 high-level heroes to fully complete the game, assuming you're lucky enough to avoid deaths along the way. And if you're not so lucky? Well, that's okay too. It's not like adventurers will stop visiting your hamlet, seeking fame and fortune. What's the harm in sending a few more into the dark? Maybe one will bring back enough resources to build that hamlet expansion this time. 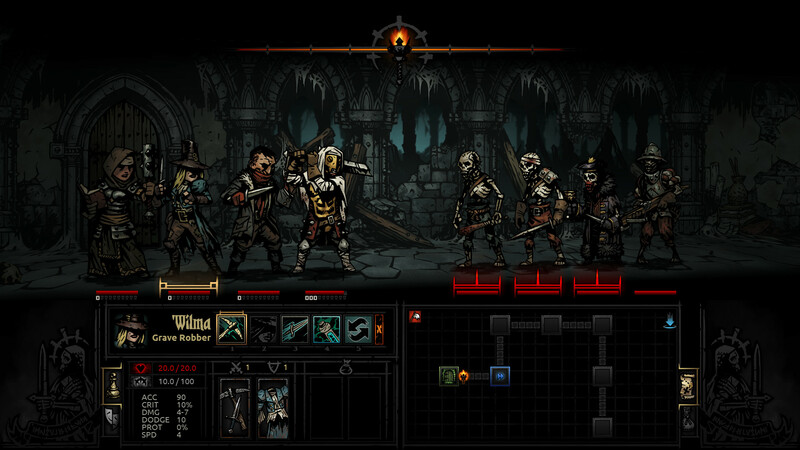 Bottom Line: Darkest Dungeon will kill your party, drive you insane, and leave you a gibbering mess at the Sanitarium. Yet it's so compelling and rewarding at the same time, you won't be able to resist diving back in for one more quest. Recommendation: Bring lots of torches. You'll need them in the dark.